The history of Equus in Tarrytown, New York (Westchester County) is noteworthy. The restaurant is housed in what once was a private residence owned by General Howard Carroll—a successful businessman, newspaperman and playwright—who built the property for himself and his growing family more than a century ago (circa 1897-1910). He named the estate Carrollcliffe. The stone structure that looks like a medieval castle is surrounded by 64 acres of manicured gardens and grounds, and sits on the highest point in Westchester County with expansive views of the Hudson River in the distance. The design of the building resembles the Norman-style defensive fortifications typically found in Wales, Scotland and Ireland. In 1941, Axe-Houghton Management purchased the property (designated as a historic property by the village of Tarrytown) as a home for its owners, Emerson and Ruth Houghton Axe, and the headquarters of their investment business. The building then became known as Axe Castle. In 1997, the castle was transformed into a luxury hotel and spa, called Castle Hotel & Spa, with a gourmet restaurant called Equus. Since that time there have been several changes in ownership/management. After approaching the sprawling property off Benedict Avenue, guests reach the entrance via a circular driveway where they are met by a parking valet. Then, they are directed either to the hotel check-in to the right or ascend a small staircase to the restaurant on the left. There are three lovely dining rooms to choose from: a Garden Room with large paned windows on three sides; an Oak Room with paneling from Europe that is said to have once belonged to Louis XIV; and a smaller Library Room with rich mahogany bookshelves and paneled ceiling. The restaurant appears in Zagat’s list for best décor in Westchester/Hudson Valley, where it received 27 points (Food rates a 23). When making dinner reservations, ask to be seated in the magnificent Garden Room. The tables are nicely spaced; all offer views of the treetops and the Hudson River. Weather permitting, plan to have a drink outdoors before sunset on the lovely terrace where you can soak in views of the river and Tappan Zee Bridge. The menu—which changes seasonally—is predominantly Auberge-style French cuisine with a contemporary twist, much of it locally sourced. The dishes are tasty, nicely served and beautifully plated. We enjoyed our meal but found the food, which ranged from decent to good (depending on the dish), didn’t quite live up to the setting. Yet, the magical ambiance still makes Equus a special place for a romantic dinner, to celebrate a milestone event, or to wow an out-of-town guest. In our experience, Equus is definitely worth trying (reviews of food and service on Yelp and Open Table are inconsistent). We have returned many times over the years usually with long lapses in-between. The prices are comparable to fine dining in New York City and more expensive than many suburban equivalents. Still, you can’t help but feel like royalty being served in this stunning one-of-kind setting with such a rich history. 400 Benedict Avenue, Tarrytown, New York; located about 30-40 minutes from Manhattan. Open for breakfast, lunch and dinner, and brunch on weekends; reservations can be made on OpenTable. The Castle also offers a full-service spa for day-trippers. *Visionary Chef Dan Barber’s restaurant, Blue Hill at Stone Barns is located in Pocantico Hills, just ten minutes away from The Castle. 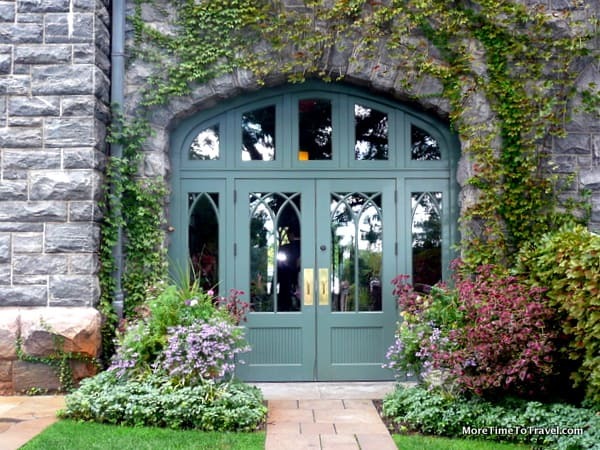 If you are planning to stay at the Castle overnight, for a truly special weekend and meal of a lifetime, try to snag a dinner reservation (well in advance) for Blue Hill’s spectacular farm-to-table tasting menu. Then enjoy a relaxed breakfast or brunch the next morning at Equus.